WHY IS TANNING SO BAD FOR YOUR SKIN? Ultraviolet radiation, whether from the sun or from a tanning bed, is a carcinogen (a substance that promotes cancer), just like cigarettes are a carcinogen. And just as there’s no safe amount of smoking, you can’t get a safe tan. UVA and UVB are two types of ultraviolet radiation. UVB affects the superficial layers of an individual’s skin while UVA penetrates the skin deeply. According to the Skin Cancer Foundation, UVA rays account for up to 95 percent of the UV radiation reaching the earth’s surface. Learn more about the differences between UVA and UVB, as well as the differences in sunscreen and sunblock here. There are numerous studies that have consistently shown that indoor tanning increases all forms of skin cancer. Sixty-seven percent increased risk of developing squamous cell carcinoma. Sixty-nine percent of people have an increased risk of developing basal cell carcinoma. People who first use a tanning bed before age 35 increase their risk of melanoma by 75 percent. Occasional use of tanning beds triples your chances of melanoma. Melanoma is the most common form of cancer in young adults aged 25 to 29 years old and the second most common in people aged 15 to 29 year olds. Melanoma is the leading cause of death in women aged 25 to 30 years old and second leading cause of death in women aged 30 to 35 years old. 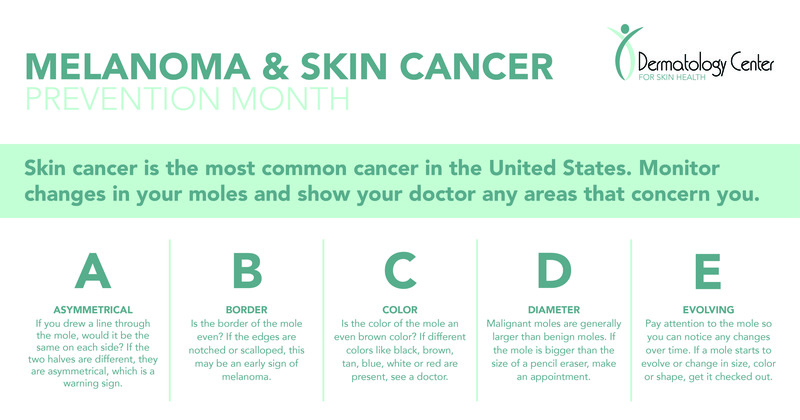 Melanoma can develop from existing moles or even may look like a mole. They are usually black or brown in color, but can sometimes be pink, red, blue or white. To monitor the changes in your moles, you can use the ABCDE method, developed by the Academy of Dermatology. Unfortunately, researchers have found that tanning is addictive like nicotine. Is really worth it to forming a bad habit that increases skin cancer and promotes aging? Use sunscreen year round with a SPF of 30 or greater and sunblock that works on both UVA and UVB rays. Look for products that use the term "broad spectrum." THERE IS NO such thing as “safe tanning”. If you have been exposed to tanning beds or have a skin lesion, it’s important to make an appointment with your dermatologist for a full body skin check. To talk with our dermatologist about changes on your skin, call 304-598-3888.